This is a response to the article appearing in the Daily Mirror of 22 November 2016 titled “Anti-Muslim hate post-war Sinhala Buddhist and selective truth telling” by one Hafeel Farisz. The article immediately recalled the interview with Dr. Ameer Ali on ‘Muslims are self-alienating’ beseeching Muslims to ask themselves whether they want to be Muslims of Sri Lanka or Muslims in Sri Lanka, appealing to Muslims to look at how the world looks at them and why. From America, Canada to Europe and other parts of the world why is there growing resentment shared by all towards Muslims? If so, it clearly underlines the need for self-introspection and re-adjustment instead of pointing fault at only the Sinhala Buddhists. 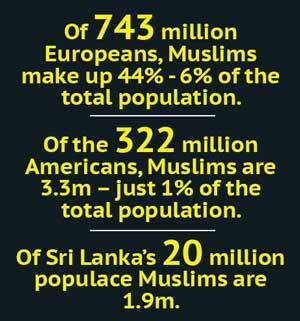 Islamaphobia was coined not by Sinhala Buddhists but the West. Media too must play a role in uniting communities instead of using their communication modes to divide people and fan ethno-religious tensions. Can Mr. Hafeel explain world opinion against Muslims? Yet it is Sinhala Buddhists who are only faulted. 89 mosques in US attacked between 2010-12 – FBI and NYPD even has informant programmes to infiltrate mosques/communities to keep tab on them. Europeans are calling for a moratorium against mushrooming mosques while countries are banning the face veil. Ironically ISIS has also banned the burka. More Muslims have been killed by Muslims! According to a 2009 report published by the Counter Terrorism Centre at the United States Military Academy, Al-Qaeda kills over seven times more Muslims than non-Muslims. ISIS has killed thousands of Muslims across the Middle East, including beheading Sunni Muslims in Iraq for failing to pledge loyalty to them, executing Imams for not submitting to them, and even killing an Imam in Iraq for simply denouncing them. Wahhabi Islam is a creation of Colonial British. The new trends in how Muslims dress, behave and demand are all Wahhabi Islam related. Wahhabism is not true Islam. Muslims themselves do not see eye to eye – Sunnis, Shias are fighting each other, harmless Sufis are attacked. The crimes between and among the Muslim world is far more horrendous and frightening than the allegations made by Muslims against non-Muslims. There is not one single word in any Buddhist text that calls people to war or to kill. However there are 109 lines in the Quran calling Muslims to war with non-believers whatever context it is used. Dr. Ameer Ali, a prominent Islamic scholar, former advisor of Muslim Affairs of Australian PM John Howards’ Government in an interview with the Ceylon Today in 2013 said Muslims in Sri Lanka were self-alienating and isolating themselves due to Saudi-influenced orthodox Islam that has influenced how Muslims in Sri Lanka dress, their values and their practices, prompting confrontation between communities. He cites Muslim women dressed in sarees in the 1970s, he mentions 58 mosques in Kattankudy with only 20 people at prayer and asks why Muslims want to spend millions planting dates to make Kattankudy look like Arabia. Attempts to destroy the Bamiyan Buddhas were made by emperor Aurangzeb, Abdur Rahman Khan until it was finally destroyed by the Taliban in 2001. Karma was such that within months US/Allies invaded & continue to occupy Afghanistan! Maldives expunged its original Buddhist history after killing/ converting all Buddhists including monks and is now destroying Buddhist artefacts inside its museum. Media never covers the persecution of the indigenous tribes in the Chittagong Hill Tracts. The Mahabodhi Temple in India was almost completely destroyed by invading Muslims. Can Buddhists be asked to forget how Islamic invaders turned to dust the oldest library in the world at Nalanda and beheaded the Buddhist monks. The media must also introspect. We implore Sri Lanka’s media to function as an unifier and not a divider of communities. Unbiased coverage has been lacking by Sri Lanka’s media – Sinhala Buddhists are only trying to protect their historical civilization & heritage – they do not demand mono-ethnic enclaves as minorities are now doing. Media has never drawn attention to the version of the Sinhala Buddhists & incursions they suffer - Kuragala, Muhudu Maha Vihara, Dambulla, Mihintale, Sri Pada, North & East Buddhist history far before Tamils from South India or Muslim Traders from Middle East arrived. The Sinhala kings followed the Dasa Raja Dhamma and killing animals was banned by royal edict. All former Buddhist majority nations are today either Islamized or Christianized. The Sinhala Buddhists are only protecting the nation from becoming known as a ‘once Buddhist nation’ too. Muslims must realize from the statistics shown that Non-Muslims have the same issues against Muslims world over and work out how to overcome these. Self-alienating and making accusations are no solutions. In addition, differences between Muslims & Muslims end in death yet the West enjoys using Muslim minority issues to advance their own imperial agendas and invariably Sinhala Buddhists become political targets. These dynamics must be understood by all. While putting the facts in perspective, we should not allow politicized issues to come between the general friendships enjoyed by all communities in Sri Lanka.